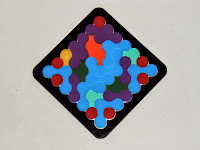 The first puzzle from Puzumi I chose to review was the Roundominoes, designed by Kate Jones and created in 1986. This one is a perfect representation of the puzzles you'll see available at Puzumi: hundreds of addicting challenges to solve and many fun strategy games for 2 players. 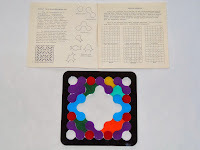 If the included challenge booklet is not enough for you, you can also create your own patterns with all, or just some, of its pieces. 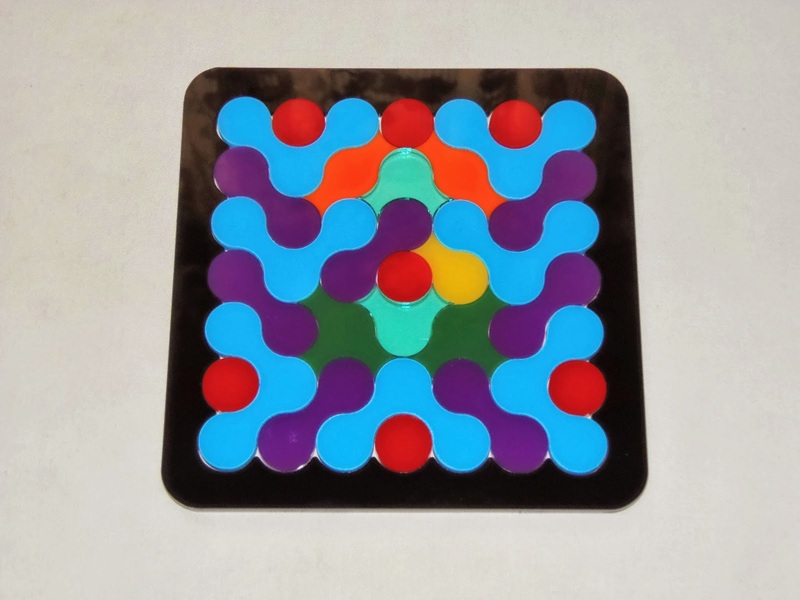 Roundominoes is made from 28 laser-cut acrylic glass tiles in 7 different shapes. There's five different color patterns you can choose from when you order it. 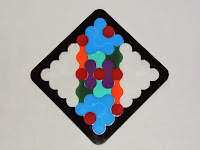 The pieces come neatly packed, in a near perfect symmetry, in a 14.5 x 14.5cm (5 3/4") scalloped-edge tray. Here, you can also choose from a black or white tray. 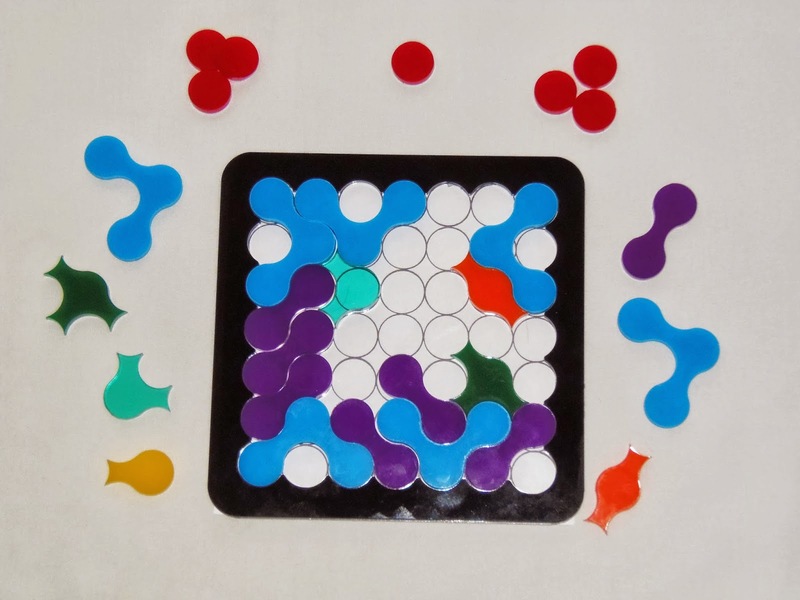 As perfectly described by Kate Jones, the pieces have these strikingly beautiful jewel-like colors. Honestly, this is something very difficult to photograph and to make it justice. Only in person you can witness its true beauty. 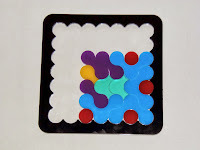 Building patterns with the Roundominoes is not overly difficult in itself, although there are some pretty tough ones to try. 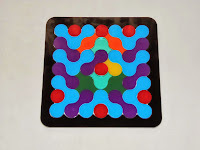 The hardest part about them is to try and solve them with the best symmetrical pattern you can find, which most of the times is extremely difficult. 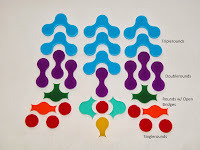 Each of the included challenges always has dozens of possible solutions, but only a fraction of them show a more elegant arrangement. It's up to your patience level to settle with a valid solution or to go that extra mile and find that perfect solution. 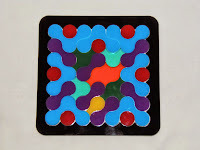 Many of the Roundominoes challenges and the strategy games will only use some of the 28 pieces, and with the irregular-edged tray it can sometimes be a little difficult to know where exactly each piece goes. To help you this, a printed game grid was included to place in the bottom of the tray and show you the exact spots of the 49 circles. You can remove it after you finish a challenge for that extra shiny and transparent look. Below is an example of a strategy game where you use the singlerounds as tokens and take turns with another player to place one piece at a time in the board. 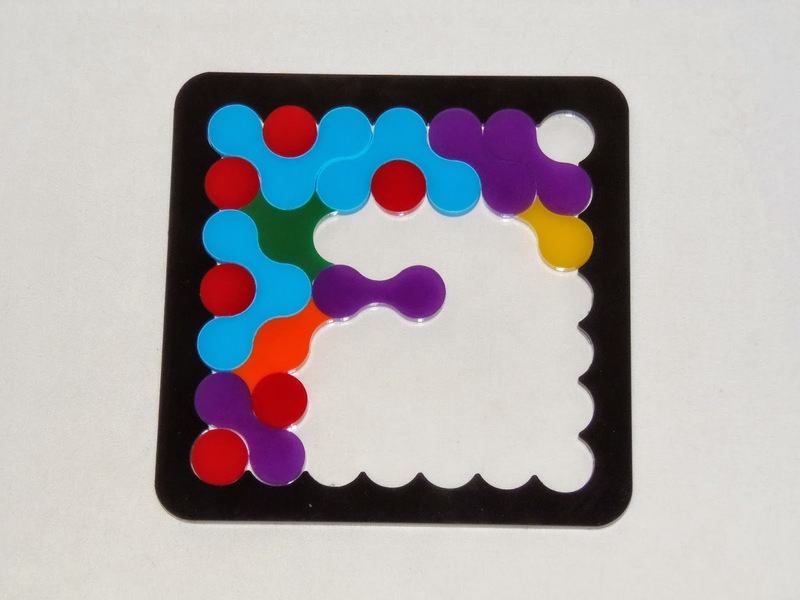 The last player to fit a piece in the board wins a token and the first to reach four tokens wins. 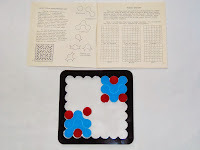 (Click to Enlarge) - Strategy Game "Round-Out"
Below are three examples of challenges that use less than a full set of pieces. The first, two 3x3 squares, can be achieved with only two types of pieces and a perfect symmetric pattern. The second, a wreath, a tad more difficult, uses a big part of the grid, but leaves empty spaces, which are quite tricky to visualize as you try to get the right pieces in place. I couldn't come up with a good symmetry for this one, but a better arrangement is most certainly possible. Finally, the third is a diagonal stripe. I thought it was best to photograph it with the tray in the diagonal to better showcase its nice symmetry. 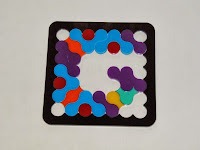 Next, you can find examples of two letters from the alphabet, the G and the F - I wonder what these two stand for... 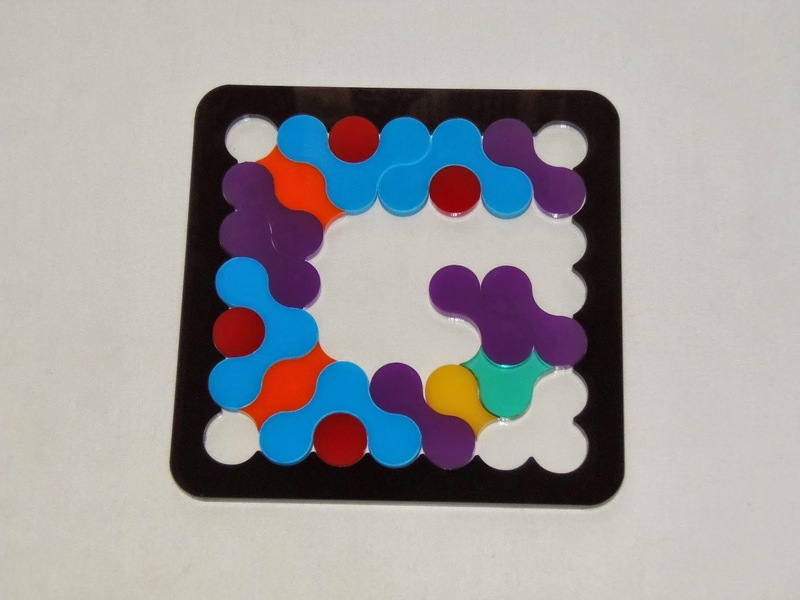 They weren't so difficult to solve, but symmetry is hard to achieve with those letter shapes. You can solve any of the 26 alphabet letters and the ampersand, always with less than a full set. You might be wondering, if you can solve any letter, how about numbers? 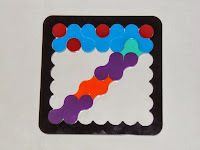 - Well, you can also build any of the numbers from 0 to 9, even though the 0 is the exact same shape as the O, and the 9 is just a 180º rotation from the 6, so those can't be counted as different challenges. Below you'll see the lucky number 7. ... And last, but not least, and surely not easier, you can see two challenges where some prerequisites are needed to meet in order to solve them. 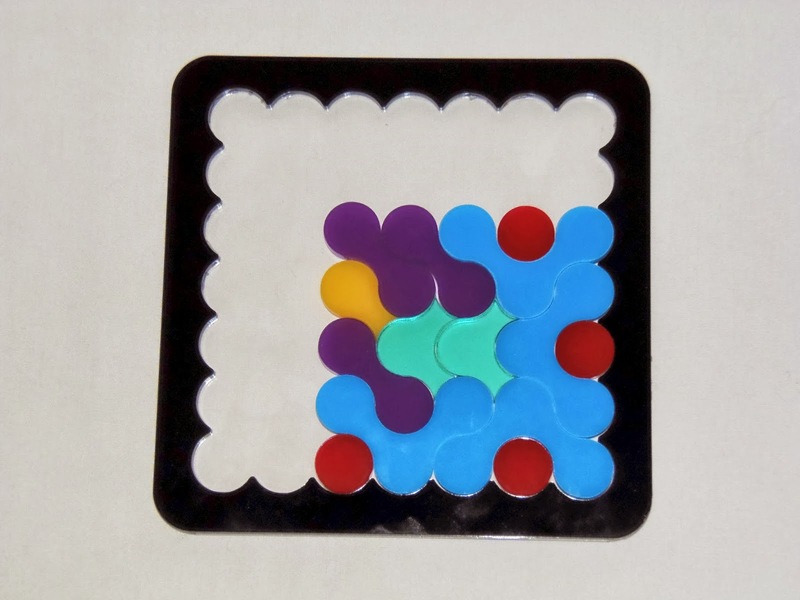 The first is a simple 5x5 square, except you can only use four singlerounds in the solution. There are many solutions, but they're not easy to discover. The second, not surprisingly, is much more challenging, but quite rewarding when you solve it. 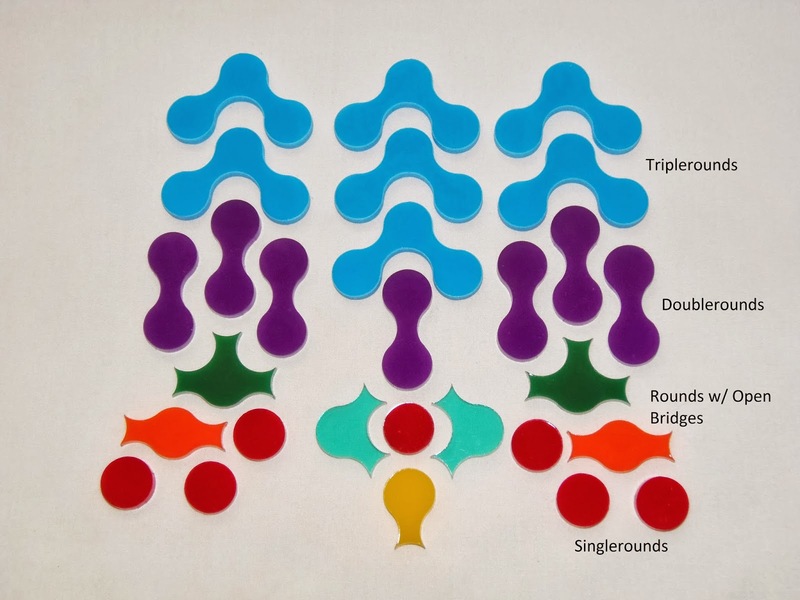 You have to set all seven singlerounds in the tray prior to the rest of the pieces, and then solve the puzzle around this preset layout. There are many of these to solve. 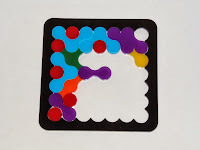 Roundominoes, just like the two puzzles I already own from Kate, is among my absolute favorite puzzles in my collection. Having recently surpassed the 1000 puzzle mark, this only goes to show the real value of this magnificent puzzle. Now, with Puzumi, you can expect high quality puzzles at affordable prices, and if you don't already own one, you're missing out on some of the best looking puzzles you'll ever have the pleasure of playing with. When it comes to puzzles like Roundominoes, I always like to say, your imagination is the limit. 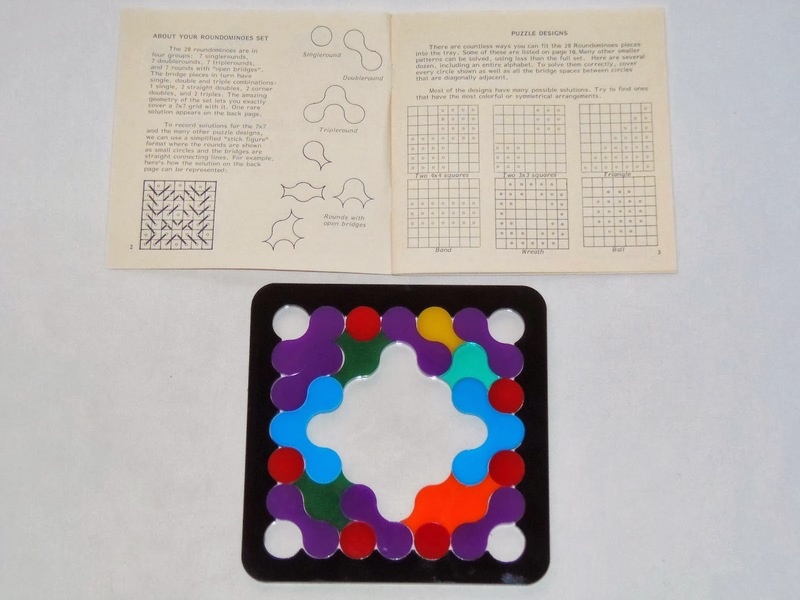 Acrylic puzzles never looked so amazing. Availability: The Roundominoes is available at Puzumi in 5 different color patterns. 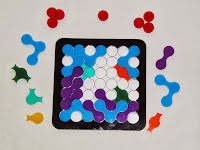 For an additional challenge and more ways to build patterns, you can go for the Super Roundominoes, which packs four more different types of pieces. 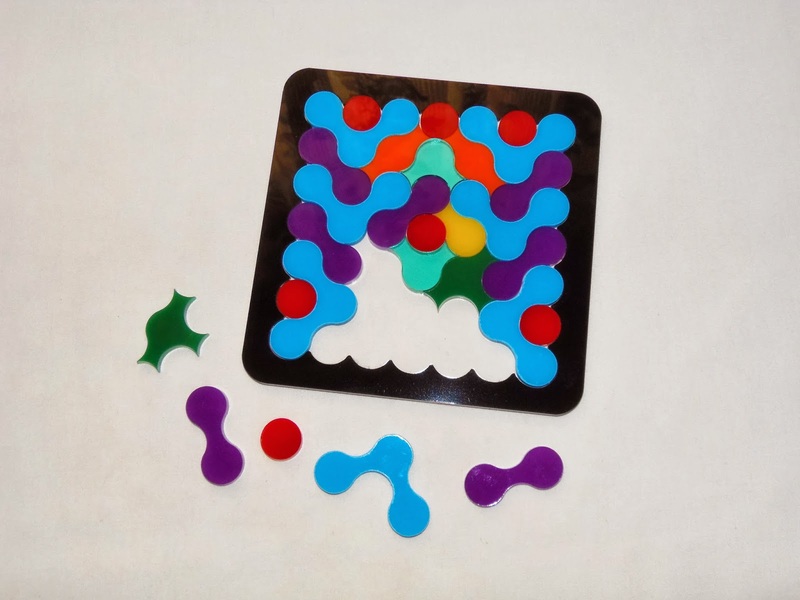 To browse other great puzzles from Puzumi, check out their online store. Great review, Gabriel. Very detailed and spot on.